Visiting your local barista every day for a cup of coffee can get expensive over time - especially if you like iced coffee as much as I do. Making a chilled cup of coffee at home is a great money-saving solution, but until I found the Zoku Iced Coffee Maker, most of my attempts ended in a watered down drink. This coffee maker turns piping hot coffee into iced coffee in a matter of minutes - I use it all the time and it has saved me lots of money. Call me crazy, but whether it's a sweltering summer day or one of those biting cold mornings, you're probably going to find me with a cup of iced coffee in hand. It may sound moderately insane to trek through the brisk New York City streets with a drink that's nearly frozen, but if you take a look around, you'll notice that dozens of other commuters have the same drink in spite of the weatherman's forecast. Although iced coffee has been around for decades, the popularity of the drink certainly hasn't subsided. Giant coffee chains like Starbucks have extensive chilled drink menus, and most small cafes have an iced coffee option. I'm here for it, don't get me wrong, but I still can't get over the outrageous prices cafes charge for a simple iced drink. The solution to my spontaneous need-for-caffeine finally surfaced when I found the Zoku Iced Coffee Maker at Bed Bath & Beyond. This tumbler promises to turn hot coffee into iced coffee in a few minutes without watering down your coffee. Though it seemed too good to be true, I dropped the money and gave it a shot in hopes of giving my wallet a little break from the baristas. 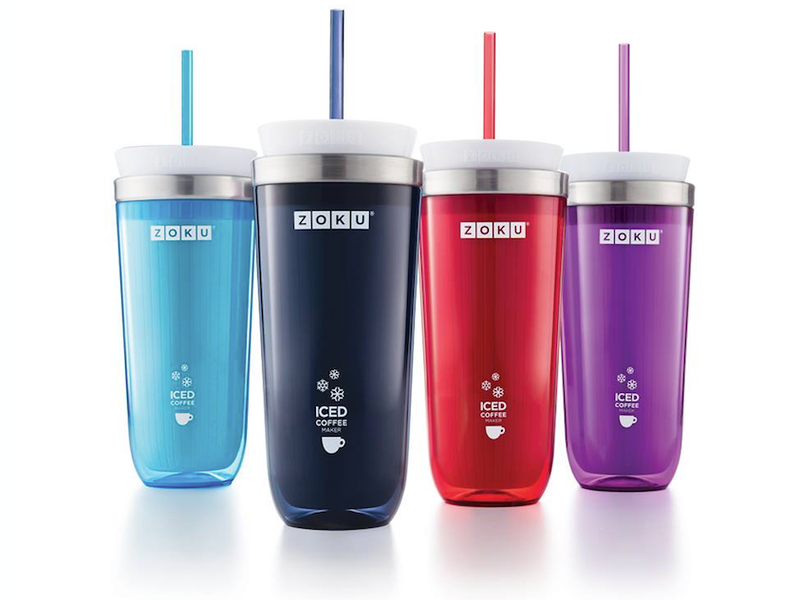 From the outside, this cup looks like any other travel mug, but the Zoku Iced Coffee Maker has special features that make it stand out. It has three separate parts: the stainless steel inner core, the protective sleeve, and the straw. The steel core is what helps you turn hot coffee into iced coffee. The instructions are simple: Place the inner core into your freezer for a minimum of eight hours, take it out, slip it into the protective sleeve, and pour your piping hot coffee into the cup. You don't have to wait for your coffee to cool a bit before pouring it into the cup. I was impressed that it took just six minutes for my coffee to turn into the cold drink I wanted. Though the drink comes out completely chilled and ice isn't necessary, I still like to add a few cubes to my coffee to make it feel more like an iced coffee from a cafe. I appreciated that my drink didn't get watered down from the additional ice, because it was never diluted in the first place. Better yet, the ice didn't melt as quickly as it would in a plastic cup because the stainless steel inner core of the tumbler kept my drink cold. If your chilled drink of choice isn't a cup of joe, the Zoku cup can still come to your rescue. My sister loves caffeine but hates coffee. She found the nifty tumbler helpful for brewing hot chai tea. She adds it to the frozen cup with a bit of milk to make her favorite brew. The Zoku Iced Coffee Maker isn't free of problems, of course. If you want a second iced cup of joe, you're going to have to re-freeze the core since it can only stay cold for so long. I found it best to pop the inner core in the freezer the night before a work day so that it would have time to freeze before I needed to rush out the door in the morning. Spending around $30 on a tumbler seemed like a bit of a stretch when I initially bought it, but when I noticed how much money I was saving by skipping my trip to the coffee shop around the corner, $30 didn't seem like much of an investment at all. The $2.5 trillion investment giant behind Fearless Girl has been voting against gender and diversity resolutions. Here's why. 10The $2.5 trillion investment giant behind Fearless Girl has been voting against gender and diversity resolutions. Here's why.